Tomatoes arrived in Italy from Peru and other parts of Europe, in the 16th Century. 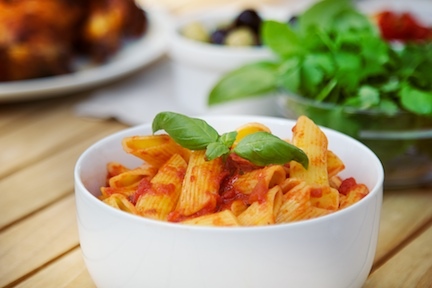 Now, it is hard to imagine Italian cooking without tomatoes – especially the sauces used on pizza and pasta. Their ability to transform humble and largely tasteless pasta makes them a tried and trusted favourite in any kitchen. The range on supermarket shelves and fridges now offers consumers enormous choice – whether it’s meat based or vegetarian sauces. Home made Italian tomato based sauces, such as the ever popular bolognese, which also contains minced meat, are usually sweeter than those sold in Britain due to the use of San Marzano tomatoes. There are now probably as many variations of tomato based sauces as there are shapes of pasta, and KaTech’s technical team has the know-how to ensure your product succeeds in this crowded marketplace. Most are flavoured using combinations of garlic, onion, salt and chopped basil. Viscosity depends on the end dish. A sauce for a lasagne or cannelloni, for example, would be slightly thicker than a bolognese. Passata (tomatoes which have been sieved to remove skin and seeds) is used as the base, supplemented by tomato puree which can be hot or cold break. Hot break is slightly thicker due to the inactivation of the pectinases naturally present in tomatoes so the natural pectins contribute to a greater viscosity, but the less expensive but thinner cold break tomatoes (which because of the lower processing temperature allows the natural pectins to be destroyed) can be upgraded by the addition of pectin or other hydrocolloids during the sauce manufacturing process and then heated to 95OC (thus destroying the pectinases) will add a creaminess, viscosity and mouthfeel to the final sauce. Products for use on pizza can also be improved by the addition of light gels which prevent the sauce seeping into the base and making it soggy. If you need help developing your new product please get in touch. Some problems can occur when developing tomato based sauces and our technical team will be happy to advise you on how to avoid these. Lasagne, for example, can be affected by the tomato and béchamel sauces intermixing and the pasta drawing them together. There can also be some oil separation in bolognese sauces if the minced meat is too fatty. This can generally be controlled by hydrocolloid or starch viscosity. A more common problem is starch damage caused by high speed centrifugal pumps during high temperature pumping to filling stations. We can recommend protective colloids to help you avoid this – and which can also add a fresh shine to the sauce. If you are experiencing issues with a product please get in touch, we would be glad to help. Our team at KaTech can advise you on ways to reduce the expensive tomato solids content of your sauce recipe – while still producing a product which has great taste and texture. The texture of tomatoes can be imitated by the use of hydrocolloids, which can introduce a pulpy texture. The tomato solid level is reduced but the sauce still retains a strong tomato/basil flavour. We’re committed to helping you create successful products which cost less to make. Talk to our team today – we’ll be happy to show you how.